The Horizon 2020 project CopHub.AC – coordinated by Z_GIS - started in October 2018. The vision of CopHub.AC is to establish within the next two years a long-term Copernicus hub to consolidate and sustain the Copernicus Academy as a knowledge and innovation platform. 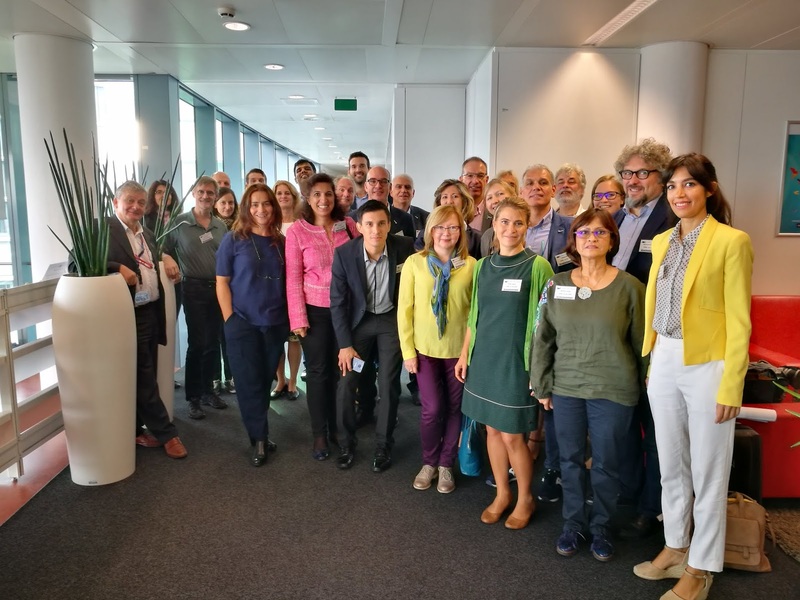 With 13 European partners involved from academia and industry, including associations from the GI / EO sector, the project pursues specific activities on developing a knowledge landscape, new formats of research briefs, outreach and sustainability. It will focus and link ongoing R&D activities on Copernicus-relevant fields on a high scientific level to make the Copernicus Academy sustainable. Together with the “sister project” CoRdiNet, similarly supporting the Copernicus Relays, the joint Kick-off meeting took place at Research Executive Agency (REA) and NEREUS Secretariat in Brussels on 11th and 12th of October with in total more than 30 participants from all over Europe discussing and planning project-specific and joint activities. 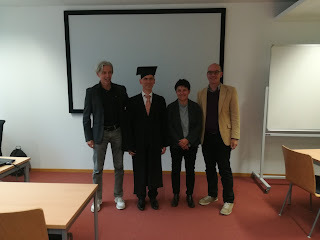 Gyula Kothencz, PhD student within the Doctoral College „GIScience“ successfully defended his PhD „Data and information development methodologies for green urban area planning and management“. 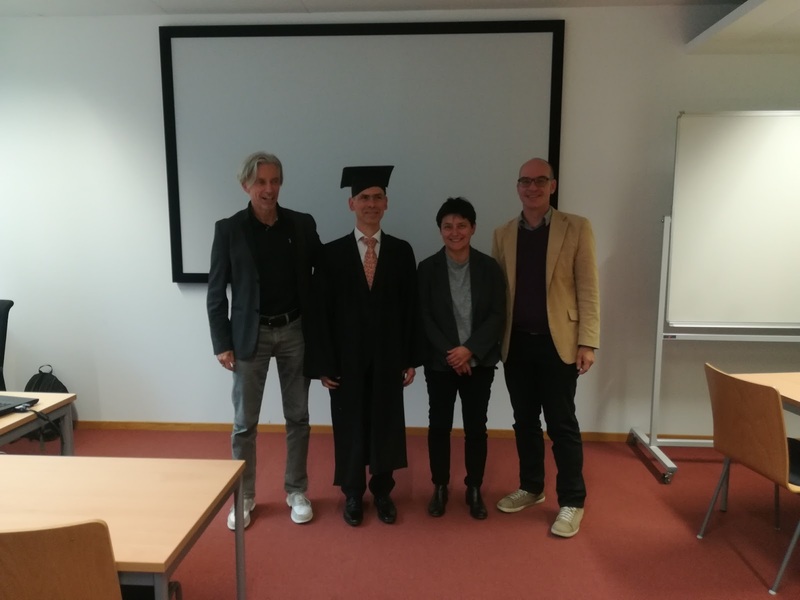 In his dissertation, Gyula developed methodologies to map objective and perceived green space characteristics as well as to produce cost-effective urban vegetation height maps from satellite imagery. The research is comprised of three methodologies. Firstly, Gyula investigated the correlation between green space visitors‘ perceptions and spatial green space indicators. Then, he predicted the influence of perceived green space characteristics on two indicators describing human well-being, which are green space visitors‘ level of satisfaction and quality of life contribution of the green spaces. In this research he investigated also the potential of geo-tagged photographs and running trajectories from park users. The study confirmed correlations between visitors‘ subjective evaluations of green spaces and the examined objective, a.k.a. measurably spatial indicators of the study areas. One applied research article showed already the value for urban planners and decision makers to be able to include subjective human perception of green spaces in planning. The developed methodologies and the results are being practically applied in two similarly sized European cities, Salzburg, Austria and Szeged, Hungary in decision support projects concerned with green urban areas. We wish Gyula all the best on his future road of life! 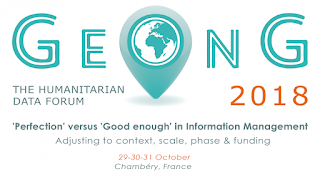 Z_GIS was invited to the GeOnG Forum in Chambéry, France on the 29 October – 31 October 2018 to present a workshop on the humanitarian service Z_GIS is providing to NGOs since 2011. 200 GIS experts and managers from Europe and Africa attended the biannual event. 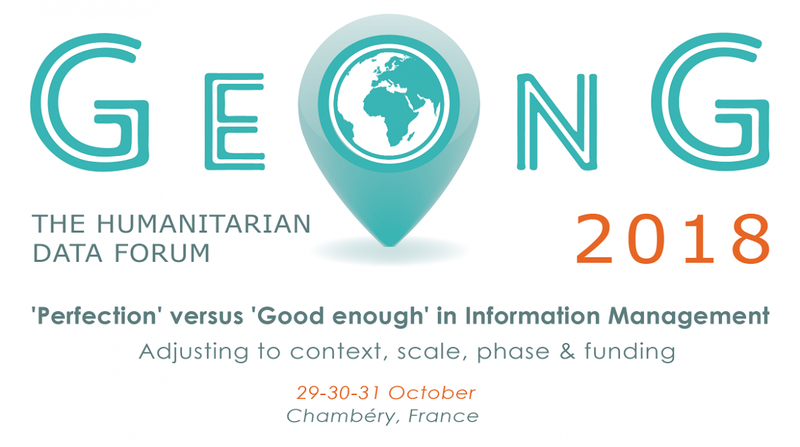 The GeOnG forum address issues related to data in the humanitarian & development sectors, including topics related to mapping, GIS, data collection & information management. This year, the Forum focused on “‘Perfection’ vs. ‘good enough’ in Information Management – Adjusting to context, scale, phase and funding”. In the context of a machine learning session, Gina Schwendemann presented the workshop: “Extraction of dwellings in refugee camps: how to do it and what it tells you”. Participants learned to object based image analysis (OBIA) in exercises related to the visualization of dwelling density and dwelling change detection in ArcMap. In a live demonstration of dwelling extraction in the refugee camp Minawao, Cameroon, it was demonstrated how the humanitarian office of Z_GIS use them for population estimation in order to supply medical-, food- and shelter logistics in remote places which cannot be found in OpenStreetMap. 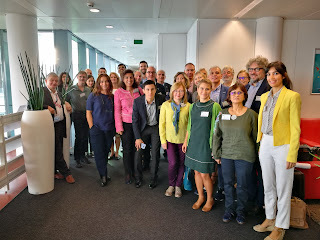 The 'Copernicus Master in Digital Earth - CDE' initiative, a joint Erasmus+ Key Action 1 project, has been kicked off at the coordinator's site 'Z_GIS' in Salzburg. This joint study programme responds to the current need of highly qualified specialists in the fields Geoinformatics / Geo and Earth Observation / Space. The two year full-time integrated Erasmus Mundus Joint Master Degree (EMJMD) Programme will start in the academic year 2019/2020. A first call for application of admission and E+ scholarships will be published soon. Geovisualisation & Geocommunication – Specialization Track @ Palacky University Olomouc, Faculty of Science, Department of Geoinformatics. Jointly, these tracks offer outstanding candidates a pathway towards excellence in advanced Geoinformatics addressing the Copernicus and Digital Earth missions and objectives. The consortium currently consists of thirteen partners, with three core academic partners in Europe who are offering double degrees, and several associated partners, who bring added value to faculty and students: Higher Education Institutions provide research facilities and supervision, Industry partners provide internships and scholarships and UNIGIS International provides outreach to students and scholarships. 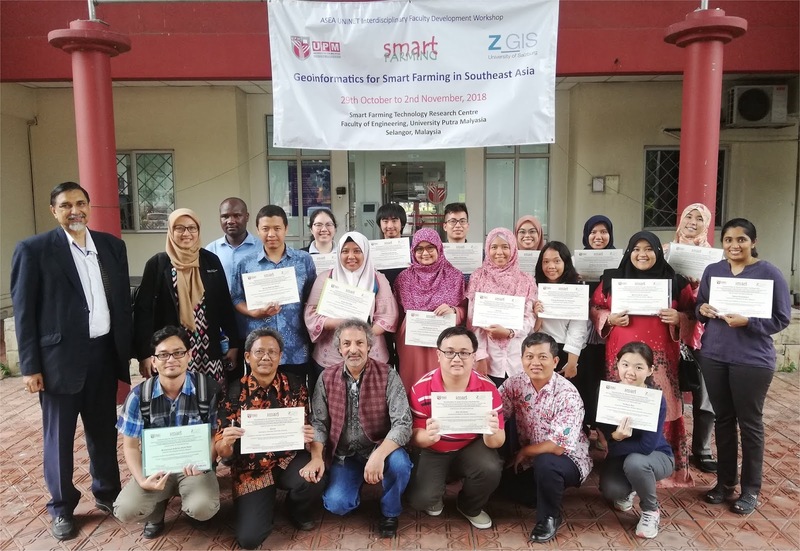 The Interfaculty Department of Geoinformatics - Z_GIS implemented a week-long Interdisciplinary Faculty Development Workshop on 'Geoinformatics for Smart Farming in Southeast Asia (smartFARMING)' at University Putra Malaysia (UPM), Selangor, Malaysia. The workshop was organised jointly by Z_GIS and UPM from 29th October to 2nd November, 2018. The smartFARMING project was co-funded by ASEA Uninet Austria. The workshop was inaugurated by Dr. (Ms) Siti Khairulnniza Bejo, Head - Department of Biological and Agricultural Engineering, UPM. The session was followed by lectures delivered by Dr. Aimrun Wayayok, Dr. Rowshon Kamal and Dr. (Ms) Samsuzana Abd Aziz (all from UPM) as well as Dr. Shahnawaz from Z_GIS. Dr. Shahnawaz (Z_GIS) conducted hands-on sessions of the workshop at Smart Farming Technology Research Centre, Faculty of Engineering, UPM. He also taught the concepts of Smart Farming and Suitability Analyses to the participants as well as trained them in using a range of data sets generated by various satellites and sensors. Having backgrounds in a range of disciplines, 30 teachers and postgraduate students from 9 universities across 4 countries (i.e. Indonesia, Malaysia, Thailand and Vietnam) participated in the workshop. They developed individual projects and explored geospatial applications of various remote sensing and other data sets in a range of disciplines and completed hands-on practical tasks with GIS software ArcGIS Desktop. All the participants presented outcomes of their project work in the concluding seminar. The workshop also included a field visit to Malaysia Agro Exposition Park Serdang for traning ten participnts in ground truthing as well as for givig first hand experience of Smart Farming activities. Prof. Abdul Rashid Bin Mohamed Sharif (UPM) conferred the certificates of successful completion on the participants and congratulated them for having benefitted from this international and interdisciplinary workshop. He also conveyed his gratitude to Z_GIS as well as to ASEA Uninet and expressed willingness to strengthen and expand the institutional collaboration with Z_GIS.